Philippe Pinel founded scientific psychiatry. He ignored previous theories about mental illness, relying on his own observations to guide treatments. Pinel made humane changes to the conditions under which mentally ill people were held. Rather than being held in chains in squalid conditions, his patients were free to move about in clean, relatively pleasant environments. He categorized different types of mental illness, recognizing some as curable and others as incurable, and documented therapies that had cured patients. He promoted the idea that mentally ill people should be understood as individuals. He recommended that physicians should keep case notes on their patients, firstly to understand their illnesses, then to evaluate the effectiveness of treatments more reliably. Philippe Pinel was born into a relatively prosperous family on April 20, 1745 in the French township of Jonquières. He was the first of his parents’ seven children. His father was Philippe Francois Pinel, a doctor and surgeon. His mother was Élisabeth Dupuy, whose family were also doctors. Philippe was educated by his mother and by a local schoolmaster, Father Gorse, who taught him Latin. Sadly, Philippe’s mother died when he was 15. Father Gorse recommended Philippe be sent to the high school in Lavaur about 20 miles (30 km) away to complete his education in the humanities. Philippe completed high school, then became a student at Lavaur’s Collège Les Clauzades. A tender-hearted and shy young man, Pinel was considered an ideal candidate for the priesthood. In 1767, aged 22, he moved to the city of Toulouse to study theology. In Toulouse he came under the influence of Enlightenment thinkers such as Voltaire, who took a dim view of traditional religion. In 1770 Pinel decided to follow in his father’s footsteps: rather than studying for the priesthood, he began studying medicine, receiving a doctorate in 1773, aged 28. He then moved to the university town of Montpellier for four years, completing his practical education in hospitals by the age of 32. He was able to earn money in Montpellier writing essays on behalf of wealthy students. He also began teaching mathematics, a subject that interested him greatly. In fact, the first two academic papers he wrote dealt with the mathematics of human anatomy. He published these in 1777. Pinel moved to Paris in 1778, aged 33. He was refused permission to practice medicine in France’s capital because his medical degree was from Toulouse, a provincial university. He made a modest living in Paris working as a medical writer, translator, and mathematics tutor. Things looked up in 1784 when he was appointed editor of Gazette de santé – The Health Journal. A friend’s suicide prompted him to investigate mental illness. He began writing about mental illness for Gazette de santé and he also secured employment in a private asylum where he could study severe mental illness more thoroughly. In 1785, aged 40, he joined the salon of Madame Helvétius, a club where intellectuals met and exchanged philosophical ideas. Also in 1785 Franz Mesmer left Paris under a cloud. Mesmer had made a fortune using ‘animal magnetism’ to treat people with psychosomatic diseases. Pinel noted that Mesmer’s methods seemed to work for some people but not for others. The French Revolution began in 1789. Pinel was moderately sympathetic to its aims and he was friendly with other sympathizers at the salon of Madame Helvétius. The French monarchy was abolished in 1792. In January 1793 Pinel was one of the doctors required to attend the execution by guillotine of King Louis XVI, an experience that horrified him. The revolution actually helped Pinel’s career. In August 1793, aged 48, he was appointed senior physician at the Bicêtre Hospital, a Paris hospital accommodating 4,000 patients including about 200 categorized as insane. 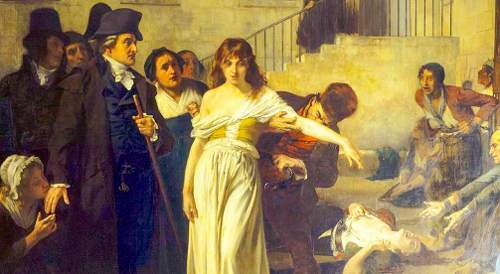 A few months later, one of France’s greatest scientists suffered the same fate as the King. In May 1794 the brilliant chemist Antoine Lavoisier was guillotined by revolutionary zealots. In the 1700s it was normal practice to restrain mentally ill people by chaining them to the walls of hospitals or asylums. It is often said that Pinel freed the patients at Bicêtre from their restraint chains. This is actually a myth. What is true is that Pinel furthered the understanding and treatment of the mentally ill substantially. In doing so he founded psychiatry as a scientific discipline. His approach to medicine and the mind, he said, was most heavily influenced by the writings of John Locke and Ètienne de Condillac. 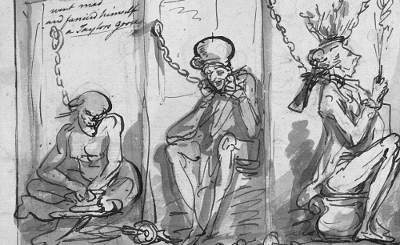 This image is part of a cartoon drawn by Thomas Rowlandson in 1789 showing patients chained to the wall in Bedlam, the infamous British asylum. Having previously worked in an asylum, Pinel was interested to see how mentally ill patients were treated at Bicêtre. There he encountered Jean-Baptiste Pussin, the head of the mental ward. Pussin was managing patients in a way Pinel had not seen before. In 1790, three years before Pinel arrived, Pussin had ordered chains removed from most of the patients, some of whom had been chained for decades. Pussin also prohibited violence against the patients. Ending the practice of bloodletting and other ancient ‘cures’ was characteristic of Pinel’s trial and error approach. If he found evidence that an approach helped his patients and he considered it humane, he would continue with it; otherwise he would stop it. Pinel abandoned bloodletting against the prevailing scientific view. Many physicians believed mental illness was caused by too much blood reaching the brain; they treated this by regularly draining some blood from their patients. The all-too-common non-scientific view was that serious mental illness resulted from demonic possession and therefore sufferers need not be treated humanely. Near the end of the 1700s freeing the mentally ill from chains was a phenomenon taking place in other European nations: for example, in Italy, directed by Vincenzo Chiarugi; and in the United Kingdom, directed by Daniel Tuke. These were not widespread initiatives – chains were only removed in a few specific asylums. Humane treatment of the insane was not a new concept in Europe: it had been practiced in both Ancient Greece and Rome, but abandoned in the Dark Ages. As the Enlightenment swept through many Western countries in the 1700s, a trend towards more humane treatments came with it. However, it took many decades before humane treatments became the norm. 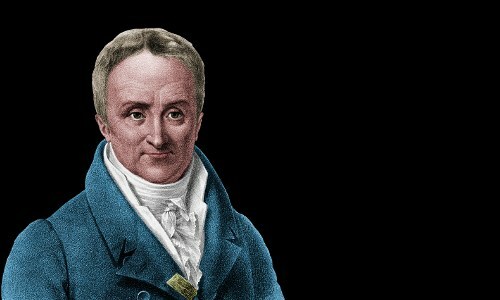 In 1795, aged 50, Pinel made his final career move, becoming the chief doctor at Salpêtrière Hospital in Paris and a professor of medical pathology. Approximately 7,000 poverty stricken female patients suffering from a variety of physical illnesses were accommodated at Salpêtrière. In 1796 Pinel ordered the chains removed from 80 of the mental patients. Philippe Pinel supervises the unchaining of female mental patients at Salpêtrière Hospice. Painting by Tony Robert-Fleury. Pinel was a dedicated man of science, committed to improving people’s lives. After reading about Edward Jenner’s successes in vaccinating people against smallpox, Pinel opened an inoculation clinic at Salpêtrière in 1800. In 1801 Pinel published his Treatise on Insanity. Rather than rely on the work of previous scholars, he used his own experiences and case-histories to probe mental illness, which he split into five categories: melancholia; mania without delirium; mania with delirium; dementia; idiotism. He presented a detailed case for moral treatment of mental patients. The meaning of the word moral here differs somewhat from our modern usage – Pinel was meaning to work responsively with the patients’ emotions. Patients should be treated in clean, pleasant, stimulating environments. Doctors should engage with patients and gain their trust; they should find out about their lives. The relationship between doctor and patient should be similar to a parental one: the doctor should be trusted by the patient, and should act with firmness if necessary. Pinel documented the case histories of patients he had treated successfully and released back into society. His patients actually had a chance of resuming normal lives. Contrast this with the many asylums in which conditions were so abysmal that their collective motto might have been “Abandon Hope, All Ye Who Enter Here.” Committal to an asylum was effectively a life sentence. Indeed conditions in asylums were so harrowing that it is easy to believe a healthy person held in one could soon be driven into mental illness. Pinel was elected to the French Academy of Sciences in 1804. Pinel married Jeanne Vincent in 1792. They had two sons: Charles, who became a lawyer, and Scipion, who followed in his father’s footsteps becoming a physician working in mental health. Jeanne died in 1811. Pinel remarried in 1815, to Marie-Madeleine Jacquelin-Lavallée. Philippe Pinel died aged 81 on October 25, 1826 in Paris. "Philippe Pinel." Famous Scientists. famousscientists.org. 20 Jun. 2016. Web. Image of George Rousseau courtesy of Dr Kenneth Wolfe under the Creative Commons Attribution-ShareAlike 3.0 License. Image of Bedlam courtesy of the Wellcome Trust licensed under the Creative Commons Attribution 4.0 International License.